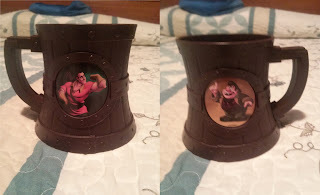 This week I have found some pretty crazy Disney Items at the Good Will and the dollar store. I will start with Monday's findings. So I went to the Good Will monday and was running late because my mom had to give me my allowence and wouldn't get off the computer. So I got to the good will at 11:35am. When I first walked in, I spotted a Minnie Mouse statue right away. It was a Snow baby figure with Minnie Mouse Ice Skating. If I was 20 minutes earlier I would have been able to get Mickey Mouse as well but someone already bought it. I was surprised the person did not take both. Oh well, but I was able to buy it. it's a cup from the New Fantasyland expansion in Disney World. You normally would buy it from Gaston's Bar for $14.95 with a drink. You could choose from this brown plastic mug that looks like a wooden mug or you could get a plastic gold goblet one that has Belle and Mrs. Potts. I picked it up for only 49 cents and there was a bit of the plastic scrapped off. Oh well. So I was on line with my items (the pepe le pew, gaston cup, and a set of napkins to embroider) when a lady comes up to me and asks me if I wanted this Mickey and Minnie figure. OMG. I was so taken back with her generosity because she was going to buy it herself. So I thanked her probably 2-3 times and left. After good will I decided to go to the dollar store to look for rubber stamps and when I went to check out I spotted disney PINS! Disney pins at the dollar store? I know I was sooo surprised. When I got home, I decided to see what was on the opposite side. These were in fact Disney pins with the official disney logo. They were from 2001 and came on the black plastic backing. The only difference is that they came with the metal backing and not the mickey shapped plastic backing. Still a Great find. I am thinking of going back next week to buy more. These make great trading pins in the park.